During either player’s turn, you can activate “Magical Musket” Spell/Trap Cards from your hand. 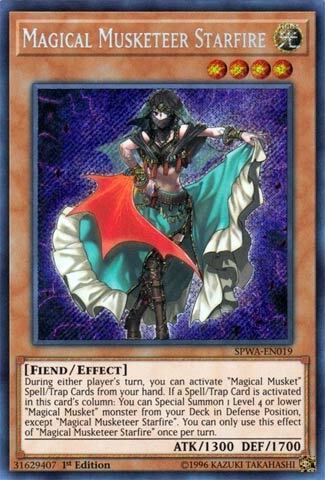 If a Spell/Trap Card is activated in this card’s column: You can Special Summon 1 Level 4 or lower “Magical Musket” monster from your Deck in Defense Position, except “Magical Musketeer Starfire”. You can only use this effect of “Magical Musketeer Starfire” once per turn. Magical Musketeer Starfire completes the Special Summon support for the archetype. While Calamity handles the grave, Starfire pulls from the deck a Level 4 or lower MM and specials it in defense position (except herself). For the price of two spell/trap cards you can pull Calamity from the deck and then pull another monster from the grave. Once per turn, but during either turn makes Starfire a great searcher to fly through your deck for what you need. Her DEF holds up better than any other Level 4 or lower MM and its that ability to pull from the deck that will set up field presence in whatever form the player chooses. Instant Xyz and Link possibilities off her effect, or the classic swarm, Calamity and Starfire are a winning combination if you have a monster in grave for Calamity’s effect. There seems to be an error and this review went live early, so if you are reading on Saturday, you get to see this early. Otherwise, we are continuing Magical Musket week with the other short print, Magical Musketeer Starfire. It has the Magical Musket clause, wait til Monday if you can’t figure out what I’m talking about and you’re reading this earlier than it should be released. Starfire lets you summon a Level 4 or lower Magical Musket from the deck if a Spell/Trap is used in the sand column. Caspar is your first choice, but Kidbrave and Doc are also good options. You can’t get another Starfire, though it is a hard once per turn. This is a staple 3 of in he deck, just because Caspar is very important.